are packed with calcareous marl and clay, with plenty of quartzose sand and good permeability. which is encouraged by keeping the wine in temperature-controlled tanks at 68°F. (2000 – 3000 liters) for another year. Following bottling, the wine rests in the cellar for another year prior to release. Aroma: Delicate, though intense nose is complex, with clear-cut overtones of withered roses, violets, tobacco, underbrush, spices, and a slight touch of vanilla. Taste: Dense, closely-woven tannins start out smooth, almost velvety, and then explode in the palate with fruit and nicely balanced freshness. Long flavorful finish. It is excellent served with flavorful meat dishes and mature cheeses. The 2005 Barolo La Rosa is a graceful, floral wine laced with perfumed red fruit, roses, sweet spices and minerals. The La Rosa possesses gorgeous textural richness in a soft, approachable style, with a long, refined finish that rounds things out. Today the wine comes across as quite primary, but with some additional time in bottle it should develop additional tertiary nuance. The tannins gain on the finish in this deceptively medium- bodied Barolo. 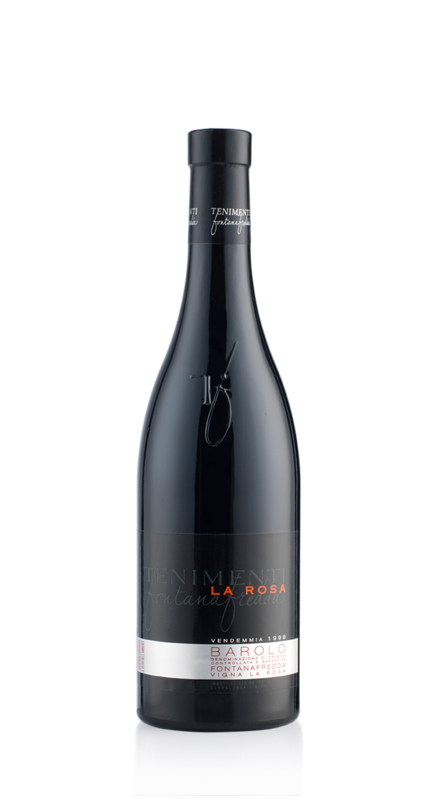 Barolo La Rosa delivers bold, dark concentration with sweet spice tones of almond paste and vanilla cream backed by sharply focused aromas of red berry, cassis, plum and mocha. In the mouth, this beautiful Nebbiolo boasts a linear but long-lasting feel. Fine harmony and sweet cherry and berry flavors are the hallmarks of this rich Barolo. Licorice, spice and tobacco flavors add depth as it stays focused and persistent through the finish. The tannins are ripe and well-integrated.